Andrei Davidoff’s Negative Space is a site of referential sculptural installation, consisting of a series of rectangular prisms. Davidoff seeks to assist the viewer in defining the internal spaces we occupy, pass through and inhabit daily. Large alien forms loom within the occupied space, creating an additional negative space within the internal (the overarching negative space) leading to visual subtraction – the viewer perceives the internal by visually subtracting the forms from the architectural features. Interior space is defined by the architectural features which contain it; walls, floors, ceiling, columns etc, but much like our inability to see wind, only its physical manifestations, it is difficult to perceive space without visual cues. The interior is a negative space of a physical form (building). This interior also presents a psychological/emotional space. The same volume of space can be, for example, expansive or oppressive. This of course depends on the structure defining the internal ‘negative’ spaces, as well as the characteristics of light, the size and position of entrances and exits etc. Taking these core principals Negative Space seeks to assist the viewer to define the internal through the inclusion of large forms into the occupied space. Painted a flat black, these forms create an additional negative space within the internal (the overarching negative space). The occurrence of a type of visual subtraction, where the viewer perceives the internal by visually subtracting the black forms from the architectural features. This perception involves a development of a viewer activated language -Reality as we perceive it, begins with language. It is completely related to structures â€“ macrostructures that contain microstructures that contain microstructures. 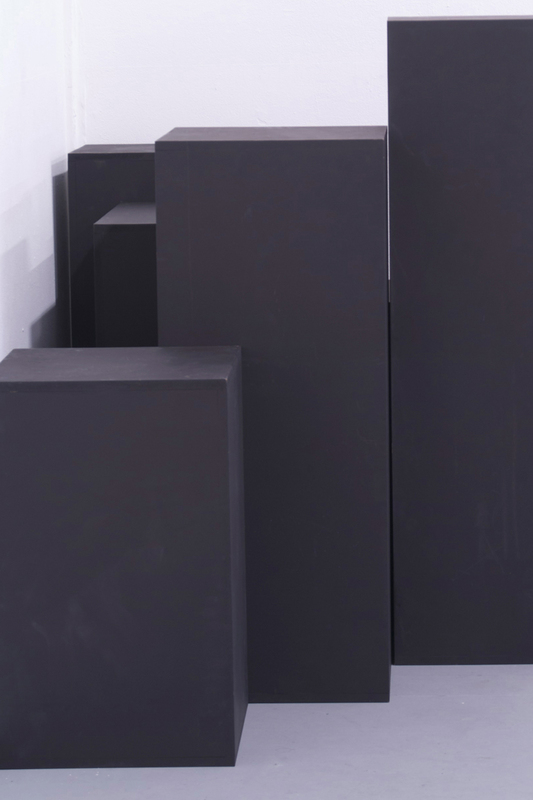 The main premise behind the work involved not the exploration of architectural spaces surrounding the viewer but the actual visualisation of spaces as solid objects in the way that Rachel Whiteread’s ‘castings’ do, or Jose Leon Cerrilo’s architectonic sculptures represent. The subject must be negotiated in relation to the object. The sculptures are architectectonic and structures to work with, as much as contemplative things in themselves. It is in the construction and development of the subject that situate the structures. Just as architecture, in order to be architecture, needs the passing of a body to be actualised. A major area of tension…between subjective and rational form objectives. This in itself creates a major area of tension…between subjective and rational form objectives.